What do we truly know about God? How can relate to a being of pure perfection? Do our lives and problems matter to Him? What could we ever do to please Him? He is perfect, and beyond imperfections. The best answers to these questions is the Revelation itself; more specifically, the beautiful and majestic divine names Allah has disclosed to us, through which we are to know Him. 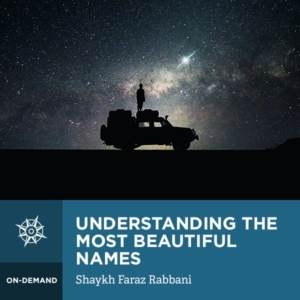 In this awe-inspiring course, Shaykh Faraz Rabbani leads us through a journey of learning about, and benefitting from the Beautiful Names of Allah. This course is an encapsulation of the teachings of many great scholar-saints of Islam. You want a shortcut to Paradise? The Messenger of Allah, Allah bless him and give him peace, promised Paradise for something very simple: “Indeed, Allah has Ninety-Nine particular Names – one hundred minus one – whoever encompasses them will enter the Garden.” (Bukhari) In this course, Shaykh Faraz Rabbani beautifully explains the meaning of the above hadith, its implications and the meanings of the Ninety-Nine beautiful names of Allah. Not only that, it explains how the beautiful names relate to God’s attributes which are detailed in the Science of Theology. And it focuses on how each believer can (1) connect to Allah through each one of the beautiful names, and (2) how he can embody the implications of each of these names – qualities which makes one beloved to Allah. Each of the names is explained in a manner which increases one’s awe, reverence, and love for Allah – ultimately allowing the Muslim to know more about God than any follower of any other religion, and to imbue that knowledge into the practice of the way of the Messenger of Allah, Allah bless him and give him peace.